Feb: Is Your Global Business at Risk? 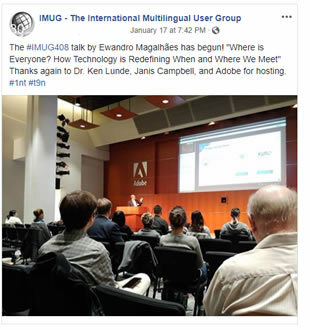 Want to Speak at an IMUG Event? Want to Suggest a Speaker? 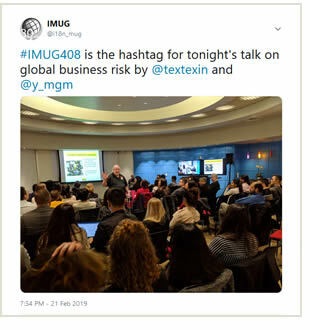 To propose a presentation for an upcoming IMUG meeting, to suggest a speaker for us to invite, or to get information on how to prepare, please see Information for Presenters. We know that only 5% of the world population speak English as their primary language. Yet, almost all titles in the top 15 highest grossing movies worldwide in 2018* were English-language productions. Similarly, Netflix Original hits such as Stranger Things or Bird Box are enjoyed across the world, while non-English content is fast-growing globally. 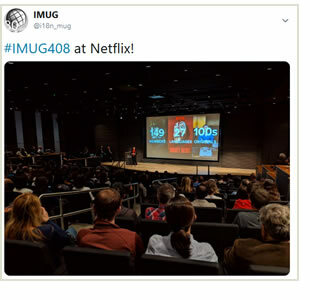 For these reasons, at Netflix we consider it our responsibility to bring those global perspectives forward, so that we can deliver the best multilingual experience to our members, no matter where they are. One of the ways we deliver this multilingual experience is of course through subtitling our content for a truly global audience - and we invite you to join us as we have a look at how we do this at Netflix. Our Globalization team will walk you through the different aspects of the work, connecting our global audience to the shows they love, in the language they speak. Choosing the right Machine Translation for a project is hard: the performance of every engine varies across domains and language pairs, and changes often. With domain-adaptive NMT it's even harder, as there's an additional difference in training corpus requirements and complex cost of ownership models. In this talk, we describe the approach to address those issues. A large-scale reference-based scoring filters candidate MT engines and identifies a "decisive" set of segments for human LQA. A specific LQA procedure is tuned to choosing the best rather than just an acceptance. Also, we look at the learning gradient to estimate if the same engine will be suitable as more data become available. 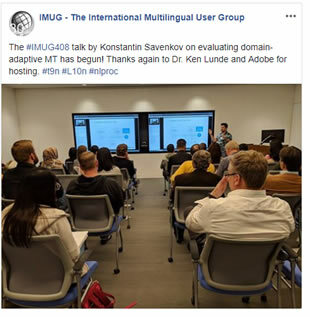 Konstantin Savenkov is CEO of Intento, Inc. After earning a PhD in 2008, he led research and development efforts for online content services, then worked as CTO at Zvooq and as a chief operating officer at Bookmate. In 2016, he contributed his experience in artificial intelligence (AI), tech and operations to launch Intento, Inc., where they build tools to discover, evaluate and use machine translation and other cognitive AI services. Is Your Global Business at Risk? Tales of catastrophic cultural marketing and product design failures abound in the globalization industry. The most egregious mistakes have damaged brand names, caused sales to plummet, and even resulted in legal action, penalties, and expulsion from regional markets. There are best practices that top performing global companies use to avoid making such mistakes. This talk will describe methods that you can use to create high quality global applications that your regional customers value. Our speakers are two of the globalization software industry's leading experts that have helped top brands deliver successful worldwide applications. They will reveal globalization key performance indicators (GKPI), their relation to potential business risk, and the appropriate timing and frequency to capture GKPI metrics. Examples of automated capture are also introduced. Remote interpretation is the biggest technology breakthrough in multilingual meetings since the Nuremberg trials. Conferences can now be streamed live, in multiple languages, to the palm of one’s hand. Speakers, attendees and interpreters are being ushered out of the room. Is this the end of in-person meetings? Join us for a discussion of the pros and cons of the new interpretation delivery platforms, and what they mean for language buyers and providers in the short, medium and long term.functionalities. Ewandro Magalhaes is a language industry executive with over 25 years of experience. He is also a senior diplomatic interpreter and former chief interpreter of a United Nations agency, where he helped introduce a groundbreaking system of interactive remote participation in all six languages of the United Nations.